Keeping the house clean was something I didn’t understand how to do. Sure, I knew how to deep clean. And now and then, I would… I would scrub the tub and the toilet, clean out the fridge and vacuum the living room floor. But the house was never kept clean. Honestly, it’s not something I really wanted to change either. The idea of having a clean house seemed like I would spend all my days running after my kids to pick up behind them. I imagined myself folding clothes and constantly putting them away. I was sure if I did the dishes regularly, it would take me 2 hours a day. That’s not how I wanted to spend my time. There were so many more fun things to do, I loved sewing quilts, I was an avid scrapbooker, I loved reading, and well, Oprah was on every afternoon. I can’t justify in the least that I didn’t clean because I wanted to sit and play with my toddlers or take them to the park. 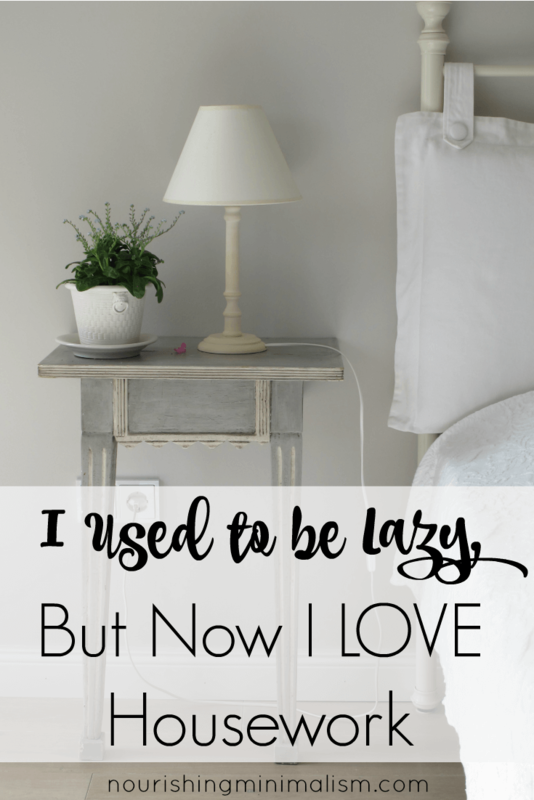 Certainly, it’s easier to claim that lofty goal, but for me, the fact is: I hated cleaning. There were so many other things I would rather do with my time and any sort of household maintenance was annoying. 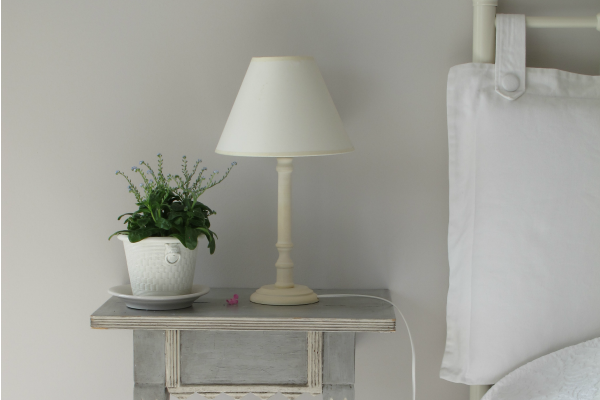 For me, the journey to finding joy in cleaning my home was a long, drawn-out process. But it doesn’t have to be for you! That’s why I’ve broken down the whole process for you here. Please keep in mind though, even though you can learn to enjoy cleaning much faster than I did, (it took me a good 10 years!!) changing your thoughts and actions is not something you can have immediate, over-night success with. But keep working at it, I’m positive you can get there must faster than I did!! Start with a simple morning and evening routine: do the dishes, throw away any trash and wipe the kitchen counters off. Doing the dishes twice day takes very little time. I do my typical routine in about 10 minutes. That means I spend a whopping 20 minutes a day cleaning house. So much for the hours idea, right? My routine even includes doing a load of laundry and getting it put away. The important thing to know about this is: if you do little things each day, it is never allowed to become an overwhelming heap. When you are planning out your morning and evening routine, keep it manageable: keep it to only a couple things. You can add more in later if you wish, but for the first month, keep it very minimal. This way it sets you up for success. If you plan out too much, that in itself can be overwhelming and you can burn out. Get rid of a bunch. It’s not fun to clean the kitchen counters when you actually have to move a rice cooker, coffee pot, kitchen aid mixer, water filter, piles of paper, boxes of cereal and baskets of fruit. To move all that and wipe off the counters? Yeah, I’ll find something else to do… thank-you-very-much. How often do you use the appliances sitting on the counter? Does it actually justify the space it takes? If you need to keep it, are there things inside the cabinets that you don’t use that you can get rid of to make cupboard space for these things? Most often things are on the counters because there isn’t room in the cupboards for them. So sort through those cupboards, get rid of things you don’t use and make space for the things you do need there. Once the counters are clear, having to wipe them clean after cooking dinner takes very little effort. That is a big secret to keeping the house clean. When you only have what you need, keeping up on it is easy. After the counters are done, work your way around the room (stay in the kitchen till it’s done) one category at a time. It’s easier to focus, if you are only going to work for 15-30 minutes. Only sort one space or category at time and put things away in that area before moving to another space. Set a weekly cleaning time. This is not something I figured out until just a few years ago. I had the daily cleaning down, but I still was embarrassed that the floors were sticky and the bathtub always needed hefty cleaners to remove the soap scum. But when I finally determined to have a ” weekly reset” of the house, it made such a HUGE difference! We have a bigger family, so now, every Saturday around 10 AM, all 7 of us get to work. One person takes the kitchen, one person the bathroom, one the living/dining room and the little kids work on their room. Brian and I normally work on the same room together along with giving direction to the littles on what steps they need to take. All the surfaces get cleaned- even on top of the fridge (say what?! That used to be a yearly chore!). The tub is scrubbed, the floors are all swept/mopped/vacuumed, everything is dusted (I always wondered when people found the time to dust the picture frames!). Because everyone is working at once, often with load upbeat music, it takes us 60-90 minutes and the house is beautiful. Like the-cleaning-lady-just-left beautiful. Then we are free to do whatever we want for the weekend. But that added to my issues. The more I thought “I hate cleaning, I’m not even good at it.” Well, the more I did hate it. As I learned to enforce the weekly cleaning (with myself as well as the kids), I noticed, I enjoyed the outcome. I learned to ask my husband to take charge of certain areas or rooms and he happily obliged. For me, I had to learn how to communicate what I wanted on “house cleaning day” instead of assuming he knew. He doesn’t care as much about the state of the house as I do, so he wouldn’t notice things that drove me nuts: like clutter collecting on the piano. He doesn’t have a problem taking care of it, he just never cared about it. Now that he knows it’s important to me, he’ll chip in and put things away. I often invited people over for Saturday afternoon or evening get-togethers, because I knew the house would be something I was proud of. And now, after a few years of having that weekly cleaning time in place, I’m excited to say that I wake up on Saturdays eager to clean. I find fun music, the kids and I race to get things done. And often times, the teens will end up talking to me while we work together. And as an added benefit: The kids are learning that we clean on Saturdays. Does it have to be the weekend? No. It doesn’t. But for most people, the best time to do this weekly cleaning is at the beginning of your “weekend,” regardless of what day it is. Because you wake up fresh and have more energy on the weekend, more so than on a typical work day, even if you are a stay at home mom: when you have no school requirements and your spouse is home, it’s easier to get the house cleaning done. Getting the house to a clean state means you can enjoy the rest of the time off without thinking of things that “should” be done. When everything is caught up and nothing in the house is pressing, your mind can relax and enjoy some much needed R & R.
This actually may help me! My house is passable but it spirals out of control weekly. I can’t stand the mess. It takes so much time to clean and it’s never clean enough. I’m going to follow your advice! Hi Rachel, thanks for the great list, I LOVE lists especiallly ones that feel do-able. Have a lovely day. Thank you! I look forward to implementing some of these! For years I have thought that something is “wrong” with me because I hated cleaning so much and only did it when it got to the point of bothering me! I do not have children yet, and it is only my husband and I, but with two full time jobs and starting our own side business and 8 brothers and sisters with families and parties, it gets chaotic and drop ins and babysitting is frequent!! I look forward to talking to my husband tonight and starting to do the 10 minute clean up every morning and night! You nailed it! I’ve told myself numerous times how much I hate to clean the house. The problem is, I am embarrassed by how dirty I know the house is. I’m good at keeping it passable, but it’s rarely truly clean. Thanks for encouraging us all to get the right mindset and tackle our homes with gusto. I grew up with the same habit in my house, except we all worked together on the same room, except for certain exceptions. As a consequences my sister’s and I learned how to clean and all love a clean house. It is hard for me to dedicate Saturdays for cleaning, since my little ones are small. So I break down my duties daily to the first hour or two of the morning, so I can start the day with my house in order. But I must agree that the seed was planted as a child on Saturday mornings. I would highly recommend the practice for character building. The blanket statement “I was lazy” insinuates many negatives that I just don’t agree with. I personally don’t think it’s lazy to play with your toddlers or take time to do personal hobbies. As women we have a tendency to downplay the need for self-care. Things like hobbies, or watching Opra are simple examples of ways we can enrich our personal growth and long term happiness. I have a saying that I use: “people before things.” I need to care for myself and the people around me FIRST before I take care of the things around me. I have had friends come over to my house and thank me for NOT gathering the clutter and shoving it into a bedroom and they could feel normal or less guilty. Maybe I have no shame. Maybe I have a higher tolerance to “clutter” or seen as an eclectic decorator. I’m ok with that. What I’m not ok with is the insinuation that I’m lazy. Thanks for your comment Kristin, typically, I agree with you and I don’t want to encourage people to put themselves down and berate themselves. But I do know where I was at that point in my life, and I would love to say that it was self-care… But that would be a lie. I purposely filled my days with everything except taking care of my home. My home was depressing, and true self-care would have been to invest in my home’s atmosphere. I’ve never been successful sticking to a cleaning routine. For a while I did have a Saturday morning cleaning session where the kids all had jobs and it worked pretty well. We always have trouble getting back to it after a vacation. I think I’ll make this a goal for the summer. I’ve come to realize that it’s an act of self love to clean my kitchen before bed. My morning self loves waking up to a clean kitchen, so every night I say, “I love myself and its worth taking 20 min to clean up this mess tonight!” It is truly an act of love because I have four almost five small children and am exhausted after dinner. Thanks for the encouragement! Also I used to hate doing dishes and then I decided to time myself one day to see how long it took to do the dishes. It only took 5 minutes to unload and load the dishwasher. After I realized it only took me five minutes I stopped putting it off and just got it done. After I had my third child my husband had a cleaning lady come to our house. She did a great job but she was there for hours! Then we found a cleaning service where they send four people to your house for an hour. They worked quickly and each had their own jobs. It was so nice and it was done quickly and my home looked wonderful when they left (I also worked for an hour before they came but that was cleaning up all the toys and clutter so they COULD clean!) I don’t have the cleaning crew come any more but it did make me realize the power of having help and also how much could get done in an hour. This is an interesting article. I don’t like to clean (at least I didn’t used to) but I like a clean house, so clean I do because I like the result. I did not learn much about cleaning growing up because by the time I got home from school everything was done. With less clutter is so so much easier for the children to help with the cleaning, hard to dust well when you need to move a bunch of stuff. I had a friend tell me, “Oh, we clean, but there is so much clutter it is hard to tell.” From the other side, having now decluttered my house, no, they probably aren’t cleaning very well, I didn’t either in that situation. Wow. Everything you’ve said in this article I can completely relate to. I do not enjoy cleaning lol. I hate asking my husband for help after he’s worked all week, but it must be done! This has motivated me to start lol. Lately I’m so lazy to clean the house and when we have guests coming that’s the time I clean which makes it harder. I like that little by little we start then once we have a routine it will be easy. Thank you for writing this post! Thanks for sharing! I love the weekly cleaning time! It really is a reset on the house and motivates you to keep up with things the rest of the week! My hubby pointed out to me that when we lived in our apartment, our house may usually be tidy, but it was never *clean*. When we moved to our first home earlier this year, I made a point to develop good habits and routines like the one you mentioned, as well as have a decluttered home (best excuse to throw things away is a move!) Now I’m so proud to have an actually clean home that I can’t imagine going back to the way I used to live. It’s nice to see other people doing the same thing I’ve come to embrace! I was starting to be a little tired of the routine- this energized me again! Thank you!